Sweet Summer: Strawberries and Balsamic “Salsa” over Grilled Chicken – Pao Says, "Open Wide!" Sweet Summertime strawberries… What could be better?? Obviously I can’t help myself when I see a giant package of beautifully vibrant red strawberries at the grocery store, just begging me to bite into them. So, inevitably, I always end up buying more than I manage. What’s a girl to do with so many delicious strawberries before they go bad?? I’m assuming I’m not the only one with this issue, so here’s a few ways to use them: slice them up and put them in a container. I find that I eat more if they’re already cut up when I want a snack. Put them in a salad! Berries are awesome in spinach salad. Toss them in a smoothie fresh, or freeze them and then toss them in a smoothie! You can also make savory dishes with strawberries, like the one pictured above. 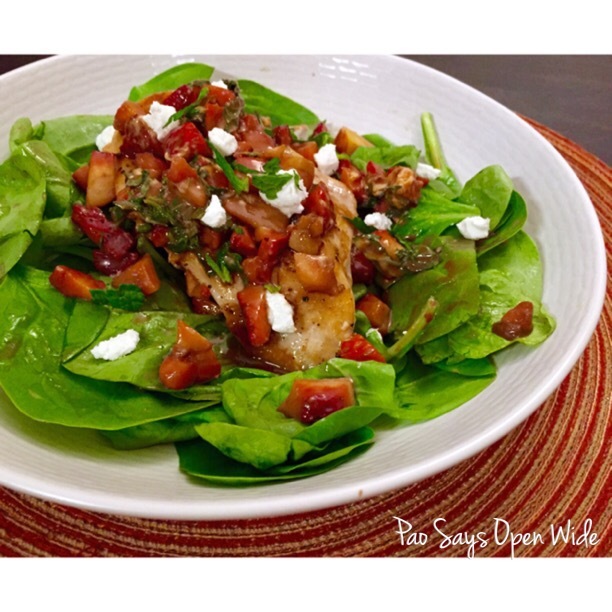 I topped some simple grilled chicken and fresh spinach with a strawberry, mint, and balsamic salsa and topped that with crumbled goat cheese… Amazing! The flavors are sweet and summery with some savory and tartness mixed in there from the chicken and the cheese. I love this dish, and it’s easy to make for one or for a crowd. The left overs next-day can even be eaten cold as components to a salad- #win! Make your salsa: combine the strawberries, mint, and balsamic glaze in a large bowl. You can make the balsamic reduction as you chop your strawberries- just bring a cup of balsamic vinegar to a boil and hen reduce over med, med-Lo heat until reduced to about 1/4 cup. Keep an eye on it because it burns easily! Add the reduction to the strawberries and mint. Mix in a tbsp of olive oil. Grill your salt-and-peppered chicken on a hot griddle with a bit of olive oil. Add half of the goat cheese crumbles to the salsa (goat cheese is easier to crumble if it’s very cold!). Once the chicken is ready, serve over a bed of spinach and spoon the strawberry salsa over the top. Garnish with mint leaves and goat cheese crumbles. Bon Apetit!